You’ve decided to become a certified Scrum Master. Good for you! Now you need to choose one of the many certifications the market offers. After thorough review, we narrowed the search down to two well-known organizations that focus primarily on the role of Scrum Master rather than on Agile practices in general. Those are Professional Scrum Master I (PSM I) from Scrum.org and Certified ScrumMaster (CSM) from Scrum Alliance. Even though CSM has been on the market longer, PSM I is becoming more popular and better respected across the board. This can be explained in part by the fact that the PSM I assessment is much more challenging than the one for CSM and, therefore, yields a more recognized certification (harder assessment means more studying and preparation, which equals a greater understanding of the Scrum framework). Thus, Microsoft uses the PSM I assessment to validate knowledge as part of its Silver and Gold Application Lifecycle Management (ALM) competencies. As a result, many companies that work with Microsoft try to have 100% of their employees certified with PSM I. All in all, PSM I seems to be more attractive in the current market. So this article will talk about the PSM I certification in detail. The application process is straightforward. 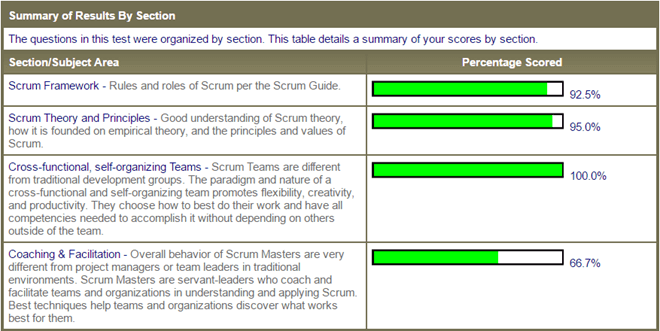 After you register at Scrum.org, you can easily navigate to the PSM I assessment page and click Buy PSM I Assessment. Once you’ve purchased the assessment, you’ll receive an email with instructions and a password that looks similar to this: d3705379durl3tr7a9xp378wzb973421-FBT2189 (the password does not expire). Click the link in the email, enter the password and pass the test. Start with the basics. Read this document two to three times, trying to understand the concept as a whole. Don’t try to remember every detail, just an overview. Do this iteratively. As you read it again and again, try to focus your attention on something new. Overall, it’s good to read the document at least 20 times before taking the test. Take a Professional Scrum Foundations class. I’d highly consider taking this course as you begin building your foundational knowledge of the Scrum framework. It’s very helpful, and you’ll be exposed to the original Scrum.org training with standardized training materials. I learned way more from this two-day training than from all the tests and books I’ve read. You also need to consider that PSF training isn’t oriented around teaching how to pass the test, but rather on explaining the many values of the Scrum framework and how it’s applied in the real world. A pleasant bonus is receiving 14 Professional Development Units (PDUs, necessary for maintaining Project Management Institute (PMI)-certified credentials) for taking this class. Take the Scrum Open assessment. Take this assessment every day, four to five times a day, until you remember and understand all of the questions. Many of these will appear on your real test. You’ll be given 30 minutes to answer 30 questions for each attempt. The whole pool of questions is around 40, so it’s important to take the test many times. The perfect result is to answer all 30 questions correctly in less than five minutes. Read "Software in 30 Days: How Agile Managers Beat the Odds, Delight Their Customers, and Leave Competitors in the Dust." I suggest this book because it provides an extensive overview of Scrum and allows you to see the bigger picture. You might understand the Scrum Guide, but you need to start thinking broader. This book helps expand the boundaries of your thought process. Take Mikhail Lapshin’s assessment in Learning Mode. This test is helpful since it’s mostly based on the Scrum Guide. In Learning Mode, you can find responses to the questions that are taken directly from the Scrum Guide. Take this test one to two times a day until you make no mistakes. Once you’re done with Learning Mode, try the Real Mode exam. You’ll find this assessment to be very different, which is good. Try to understand how the questions are formed and what’s being asked. As with previous assessments, you need to take this one at least two to three times a day until you completely understand each response and can complete it in less than three minutes. The test includes 80 randomly selected questions, each assigned to one of four sections: Scrum framework, Scrum theory and principles, cross-functional and self-organizing teams, and coaching and facilitation. Because questions are randomly chosen, you won’t know which section they refer to. At the end of the test, a high-level overview of questions correctly answered will be provided (see below). In order to pass the test, you must answer at least 68 questions correctly (85%). During the test, you’ll be able to bookmark questions and refer to them any time you need to. That will allow you to pass by tough questions and have a better track of time. You’ll have 60 minutes total to complete the test, which is 45 seconds per question. This is an open-book test, so you can refer to any materials you want to, but be careful … the clock is ticking. This article originally appeared on Sept. 5, 2017. Will the items I placed in my shopping cart be priced the same if I retrieve the cart at a later date?